Measles – also known as Rubeola is a viral infection affecting the respiratory system. Measles is endemic in nature i.e. the infection is contagiously present in a community and several people are resistant against the disease. Once a person is infected by measles, they obtain the resistance against the infection for the rest of their life. It is very unlikely to get infected by the virus for the second time. 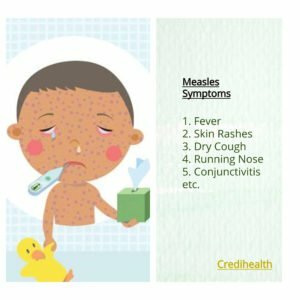 Read on to know more about measles symptoms, causes, and treatment. In general, the virus can settle on any surface and live for several hours. Hence, when a person comes in contact with the virus, they can get infected. Measles can cause several complications and is considered a fatal infection, especially in children under five years of age. As per statistics, the death rate of the people infected by the virus is more than a 1,00,000 per year and unvaccinated people are affected more. Some parents do not get their children vaccinated assuming that it might cause side effects but in reality, adult or children who receive the vaccine do not experience any side effects. It has also been found out that children with Vitamin A deficiency are at a higher risk of getting infected by the virus. Measles can now be prevented with an immunization. Due to high vaccination rates in recent years, measles infection has been limited. A study in USA found out that the instances of Measles had come down to an average of 60 cases a year from 2000 to 2010. However, the average number of cases has increased to 205 per year in recent times. The majority of these cases were in individuals who were not vaccinated. It is essential to get a Measles Rubella Vaccination since measles can cause severe complexities, like pneumonia and encephalitis (inflammation of the brain). Measles Rubella Vaccination is the best way to avoid the measles outbreak. The MMR antibody is a three-in-one immunization that can shield you and your children from the measles, mumps, and rubella (also called as German measles). Children can get their first MMR vaccination at one year of age, or sooner if traveling abroad, and their second vaccine at 4 to 6 years of age. Adults who haven’t been vaccinated can ask for the immunization from their doctors. If you or your family member gets infected by measles, avoid going out and limit interaction with others. There is no particular treatment for measles. Pregnant women should not take the vaccine, rather get vaccinated before they plan to get pregnant.